Le Cache Euro Credenza Classic Cherry (P/N 755). Designed by acclaimed, Pinnacle Award-winning designer Martin de Blois, our European Country Series wine cabinets evoke the timeless elegance of European furnishings. Architectural details such as crown and base molding, paneled sides, hardwood French doors and hand-carved accents showcase fine wine collections with a sense of luxury and style. Sealed seams, premium insulation and tinted double-paned glass provide thermal and UV protection. The delivery crew was great. Great product. Customers service needs some work. I was so impressed with the Customer Service and the look of the unit, that there was nothing else comparable. I feel confident that this unit will be all it is supposed to be. [The wine cabinet] is nicer than I thought it would be, beyond my expectations. The wine credenza is beautiful, I hope to load it with my wines in the next few days. Thank you. I am very satisfied with the purchase. The wine cellar exceeded my expectations. It's construction and operation is first class! I've only had it for a week - seems like an excellent product and value. 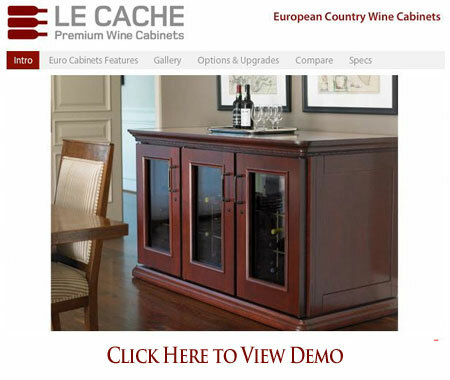 The build quality, craftsmanship and fit and finish of the wine cabinet is superb. Nice to know that things are still being made to this high standard. Nicely done! Great finish. great workmanship. great styling. great. great. great. Thanks Le Cache!! I absolutely love the wine cabinet and somehow the wine just tastes better now!